I make posts on my personal blog (and Winsome Icarus) occasionally titled "THINGS I WANT THURSDAY" listing the expensive things I need for school (external hard drive!) and frivolous things for comfort (prints!) What I really need and really want is a very large coffee mug and a design-friendly leak-proof commuter thermos. I went to Target and didn't find either. On the one hand, that was okay, because there's a mug on Etsy I have my tiny heart set on. On the other, all of the commuter thermoses (thermosi) were inferior. The ones that might promise not to leak all over the interior of my bookbag have huge handles or are too heavy. The ones that are sleek, aerodynamic, and just right, will shatter and spill hot coffee all over my homework. And probably my ipod. ahhhhhhh, I just want to drink my coffee, on the sly, on the bus, without compromising my artistic sensibility! I want to remain practical, too! Oh, the angst! I read last week that Etsy, despite serving as the home for handmade original art (my description), often sells vintage items. So I gave it a go, because Mighty Goods and the design blogs weren't churning out the results. I didn't find my dream commuter thermos, but I did find a handful of transportation related goods, and I am desperate to share. Bike All Year shirt (M) from Full Sail, $18. There are other sizes, colors, and styles available too. I know that bicycles aren't as public as a bus or subway car, but biking is still a carless way of getting around, and it's getting nice out (depending on where you live). Also, since I'm still feeling like cyclists are in as much danger of motorists as I am as a pedestrian, I don't really care what you think. Night Commute from Amy Saffner, $30. 11 x 14 print of an oil painting. Saffner's painting reminds me of a romantic, stylized, dreamlike Nighthawks. I mean that as a good thing, and I want this print so very badly that I can hardly stand it. Bring Home the Bacon, from babypop, $. Black performance fleece hand-warmers. 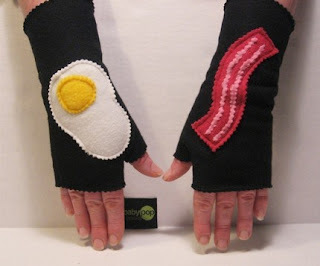 These come in a variety of styles (Pac Man, broken hearts, stars, aliens, little monsters, Peeps) but the bacon and eggs is my favorite. First, because I am not a morning person, and I like the idea of my groggy body clinging to the train as it whisks me into the city and the inch of felt bacon peeking under my winter coat. Also, my morning (afternoon, and evening) commutes could use a sense of humor. These really would be great for a commute in any chilly city, and I'm almost sorry it's beginning to get niceish in Baltimore, because I don't need them. 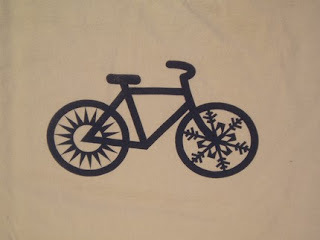 Also, I'd like these on my bike, too. There are a lot of vintage mugs, by the way. My favorite is the owl mug on the first page (because I really like birds and it's only $4). 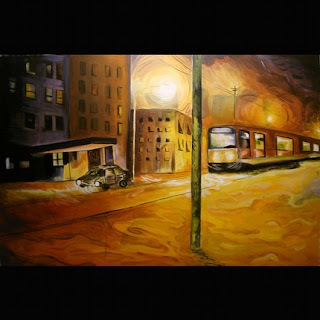 I sat in on a lecture today and found an artist who has made a number of transportation based paintings, and when I have a moment, I intend to share that, too. It's only 11? This took forever, I feel like it's already past midnight. Have you seen a perfect commuter mug that can weather the bus, light rail, and bike ride? i can't tell you how bad i need an external hard drive. my PC started to slow down so i panicked and bought one. i didn't want to lose all my photos. and then i was FORCED to get one for a EMF class (which isn't fair because it's my LAST EMF CLASS AHHHH) but it didn't cost much and it's really nice. i like Lacie. the end. BOO! not a digital photobooth! that's a total bummer. I miss the old ottobar one.